What started as a modest-sized solar project in Arizona, for agricultural services firm Gowan Companies, eventually grew to 5.9 MW and now includes three types of solar installs: rooftop, carport, and ground-mount. Solar power projects will sometimes include two different types of solar installations, such as rooftop solar and carport solar. It's not common, though, that a project will include three types of solar installs: rooftop, carport, and ground-mount. But that was the challenge California-based PPA Partners recently took on for a 5.9-MW solar project in Yuma, Arizona, for agricultural services company Gowan Companies. Gowan's original interest in solar power was fairly straightforward: they wanted to produce some energy while providing shaded parking for their employees. Their information requests and technical discussions with local resources led them to PPA Partners, a solar finance and renewable energy resource company. PPA Partners specializes in providing clients with custom-designed renewable energy solutions that make operational and financial sense. What started as one site and several hundred kWs of system grew dramatically as the economics and other benefits were presented to Gowan plant engineer Wayne Cannell and the company's senior management. The project ultimately grew from the vision of creating an employee benefit and saving on some electrical costs to a company-wide initiative offsetting nearly 9,000,000 kWh of electricity a year. Ultimately, PPA Partners, together with project partners Sternco Engineering, Eckard Commercial Construction, and Holbrook Electric, worked alongside Gowan Companies to create a highly customized PV solution of over 5.8 MWs, on nine different sites encompassing nearly 25 acres, with each of the sites divided into multiple sub-sites. A benefit of the project includes Gowan employees not having to leave their cars exposed to the harsh sun and triple-digit temperatures during the Yuma summers-every day in July, Yuma has temperatures of 90 degrees or higher. PPA Partners CEO Bruce Mercy explained that to optimize land use, a multi-application approach was developed using fixed-tilt ground mounts, rooftop, and carport mounted solar arrays. These were installed at all of Gowan's sites in Yuma including Gowan Companies' main and secondary offices, the company's Desert Depot, two Dune Company sites, three different sites at Gowan Milling, and the nearby Gowan Halo facility. The benefits to Gowan Companies have been numerous, says Mercy, from reducing their energy costs, to placing the company in the Top 20 of Corporate Solar users domestically and providing industry energy leadership. More modest benefits include employees not having to leave their cars exposed to the harsh sun and triple-digit temperatures during the Yuma summers-the number of days in July with temperatures of 90 degrees or higher is … 31. Mercy explained that he first met with Gowan's management about three years ago. "At the time, large scale commercial distributed power was only paying about five cents a kilowatt hour in Arizona," he said. "We did the analysis, and it did not really make economic sense, so we recommended to Gowan that it wasn't the right time to do something." Fast forward to the fall of 2012. "At that time, the power rates had gone up quite a bit, almost doubling, into the nine cents a kilowatt hour range, so we were able to put together a good economic plan for Gowan," explained Mercy. As with many renewable energy projects, there are a lot of moving parts, and sometimes the parts change. At the time, a number of utilities, including Arizona's APS, were taking a step back from the incentives for solar power that were then in place. APS decided to no longer offer incentives for commercial and large-scale solar projects. "So we had to go back and re-work things," explains Mercy. "We found a little-used tax incentive in Arizona that could be used with any system 5 MW or more, and it was sufficiently good that we were able to get a business model that worked for Gowan and worked for us as the developer." Multiple sites and types of solar are not new to PPA Partners. The types of projects they take on vary depending on who they are doing business with, says Mercy. "We have done some projects with school districts, and those are multiple sites, but they are usually not that big-maybe a couple of hundred kWs." Or there might be upwards of 10 or 11 sites that collectively generate 2 or 3 MWs. PPA Partners worked alongside Gowan Companies to create a highly customized PV solution of over 5.8 MWs, on nine different sites encompassing nearly 25 acres, with each of the sites divided into multiple sub-sites. They also did multiple sites for a 5-MW project at Yuma's Arizona Western College, which was recognized by the Solar Energy Industries Association (SEIA) and the Solar Electric Power Association (SEPA) as one of the three most unique photovoltaic projects of 2012. The company has to be resourceful and creative to move projects forward, says Mercy. The Gowan project was different in that they were dealing with a private, family-owned company involved in agricultural products-from manufacturing at a mill site to retail and wholesale operations. And, as noted, Gowan originally just wanted a single-site project. "Companies are in different spaces when it comes to solar power, with companies in the big utility space and companies in the residential space," said Mercy. "But in the middle space, you quite often run into multiple sites with clients because they will look at the economics on a single site, and if they are sufficiently good, they will want to expand the solar to other sites." In the case of Gowan, they did about 4.3 MWs of ground-mounted solar, 1.5 MWs of solar carport canopies, and 47 kW of rooftop and carport canopies at a Gowan office. "Our approach depends a lot on what a company is doing and what facilities they have-we work to maximize the solar operations as much as possible. For example, you don't want to take up a lot of land for solar power that a company really doesn't have." Of course, it has to make economic sense. "When we looked at putting all the solar power on carports at Gowan Milling, it was fairly expensive. But ground-mount was reasonable, so as part of the package, we purchased 20 acres of land next to the mill and built ground-mount solar," says Mercy. "Every client is a little different. Some of the projects you have to make work differently than others, but in the end, you want to make the deals fly for them. You do whatever makes the most sense with multi-site projects, and then you do a blended cost analysis. One site might be a little bit more costly than another, and you come up with a total number to do all of them." Mercy noted that PPA Partners has been involved with installing the three types of solar before, but the Gowan project is their largest. The large, ground-mount site required a fair bit of civil work, Mercy said, though it was fairly straightforward. "We had to go in there and move a lot of earth, but we did that and got it leveled off." Having some familiarity with the local guidelines, as well as previous project development, PPA was able to work very closely with the City and County of Yuma. The soil was a concern. "The soil is high alkaline, with pH levels in the 8 to 9 range, the outer spectrum of pH, and it attacks metal. If you took normal steel and put it in the ground and went to dig it up five years later, there would not be much left." So any metal going into the ground with the racking system was treated to deal with the high pH. Another issue was that this part of the state can receive very high winds-in the range of 100 to 120 mph. "So you have to make sure your racking is down tight," says Mercy. There were no environmental issues with the ground-mount site, as it was already disturbed land; it had been a gravel pit. There were some water drainage issues that had to be dealt with, but berming was built to control the water flow. Solar projects can be built in some remote locations, but it's a bonus when you can be near a major center, such as Yuma with the Gowan project, notes Mercy. "If you're remote, you have to bring all your people in, you have to have places for them to stay, and you have to bring all the equipment in-that all adds to your costs. It can quite often make a project undoable financially." As noted, PPA Partners has done a lot of projects in Arizona and knows it's in for some warm weather during construction. Mercy says, "It can be 120 degrees in the summer, so sometimes we'll run the construction crews at night." 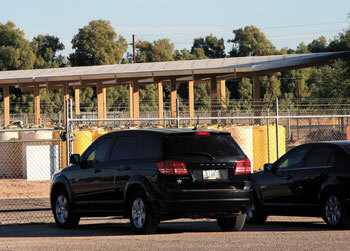 Arizona, Mercy noted, has some of the best solar resources on the entire planet. "But you have to deal with other issues, such as unpredictable weather." He says they were recently installing racking equipment at 3:00 a.m. on a different solar project. The crew had packed it in for the night, and then what seemed to be a tornado ripped through the area, which resulted in some panels having to be replaced. "The wind hit hard -and fast." A month later, the same project got hit with golf ball-sized hail. With the Gowan project, and all their projects, PPA Partners focuses on working closely with the local utility, in this case, APS. "Relations with the utility are critical," says Mercy. "That's an area that a lot of people often don't put a lot of time into. Some people in the business look at the relationship with the utility as being antagonistic, because they perceive the utility may not like solar power, so they may treat the utility badly. "But anyone who is providing power to millions of people on a daily basis, well, they have my respect. The interconnect and inspection folks from APS for the Gowan project were five star-they helped us immensely." He noted that close coordination with a utility pays off-and if you don't do it, there can be significant costs. "If you have a crew standing there, and the utility people aren't there, and you have to bring your crew back in three days and re-mobilize, your costs are going to shoot up. "It may be a challenge to deal with utilities sometimes, but they are working to protect their grid-and you need to honor that." Client communication is also extremely important, says Mercy. "Things are going to change on a project, and it's important that they know what is coming up, and what is going to change. You are going to have to adjust things as you go along, and you want to make sure the client is with you on that so that there are no surprises." They do client updates on a weeklybasis and more often, if needed. At critical junctures, where they can't move forward until the client moves forward, they are talking with them every other day. "It sometimes seems like overkill, but if you don't do it, it can come back to kick you." With both clients and utilities, meetings are inevitable-and valuable, says Mercy. If a meeting is well run, "every hour in the meeting can save me ten hours on the back end," he says. To optimize land use, a multi-application approach was developed for Gowan Companies, using carport mounted solar arrays, fixed-tilt ground mounts, and rooftop solar. Hours and days were important in terms of meeting the construction timeline with the Gowan project. They started construction in early August and had to be online by the end of the year. Prior to that, they had several months of regulatory work to go through. This included going before a Yuma Historical panel for installations near two Gowan buildings in the city's historic district. For one of the tax incentives, they had to apply January 2 for the following year-but they needed to apply with a system that was interconnected and operating to qualify. With the second incentive, there was bonus-accelerated depreciation available, and the system had to be in place by December 31, 2013, to qualify. "The project was a good deal on its own, but the incentives were kind of the icing on the cake-with those, it makes it a great deal." Thanks to a solid group of suppliers, all the deadlines were met. "Delivering this highly complex installation from the design to the final grid connection has been a fantastic collaborative effort," says Mercy. They used 305W ReneSola panels on the project, and Zilla provided the racking for the project. Colorado-based Zilla designs and manufactures innovative solar racking and mounting systems that the company says make solar power more prac-tical and affordable, achieving this through thoughtful design that facili-tates intuitive use and cost-saving efficiencies throughout the manufacturing, delivery and installation processes. AEG Power Solutions (AEG PS), and Skytron Energy, which is owned by First Solar, Inc. and is a leader in monitoring and control solutions for utility-scale renewable energy power plants, were also suppliers on the project. The AEG PS solution for the Gowan project included Protect PV.500 inverters, which feature power stacks with advanced measuring and control technology to enable DC input voltages of up to 1000 VDC. It also included MPV.Systems, whose transformer-less modular design allows up to five inverter modules to be turned on as needed to match the solar power available, to run at optimal efficiency. Skytron Energy provided a complete monitoring, control and supervision package that includes the PVGuard control room platform. The PVGuard software integrates all sites into one intuitive visualization platform. The installed instrumentation and control system incorporates intelligent string combiner boxes, data loggers, weather and irradiation sensors, and a central power plant controller. All functions of a complex power generation plant are covered: real-time condition monitoring and data acquisition, long-term data storage, and grid stability management. Mercy has been in the solar power business for about a dozen years, and when he started out, a single MW was almost unheard of, let alone the 5.8 MW size of the Gowan project. He was involved in small commercial projects in the early 2000s, doing projects in the range of 20 to 40 kW. "The players have changed many times in terms of the equipment, and the products involved in a solar project have evolved." And the cost has come down drastically from the $10 or higher per watt at that time. "The cost of the systems has dropped sufficiently so the economics of purchasing a system make a lot more sense than say, doing a power purchase agreement." That said, Mercy says companies such as PPA Partners have to be continually creative and resourceful. "From the prices to the projects themselves, things don't stay the same in solar power. If you want to stay in the business, you need to be really flexible and look at unique solutions to a lot of projects."